A TOP police official in Misamis Oriental is urging electoral candidates to seek help from the state security forces should communist rebels begin their election-related extortion activities. 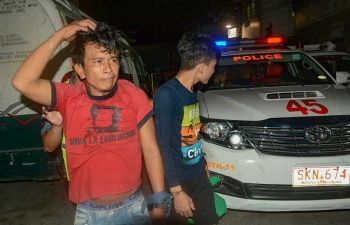 Police Provincial Director Rolando Destura said there is enough military and police forces operating across the province to thwart and counter any atrocities, attacks, and illegal activities of the New People’s Army (NPA). “We have two battalions operating province wide and more than 1,000 police to counter illegal activities of the NPA especially this May elections so we ask our future leaders to seek help from us,” Destura said. The province's top cop said the police on the ground are also focusing on areas in the hinterlands frequently visited by the NPA fighters to prevent them from doing further disruption in the May polls. Destura said there has been no election "hot spots" in the province but they are making sure that the elections will remain peaceful and orderly. He said strict checkpoints in each town have been implemented at the start of the election period over the weekend. “So far, wala pa namang report na may nag violate ng Commission on Elections gun ban(So far no one was reported to the Comelec who violated the election gun bun),” Destura said. The military and the police are calling on all candidates not to give in to the extortion demands of the NPA through either material, food or monetary support in exchange of protection and permit to campaign in rebel-infested areas in the province. For his part, Governor Yevgeny Emano said he has not received any form of extortion activities from any NPA unit. "Wala may nangayo para anang permit to campaign," Emano said. “It has been our principle that we are not giving. We have the rights as long as they are voters in the area,” he added.